It’s earth day, of course, or the tail end of it, and today’s suggestion was to write something in connection with that. 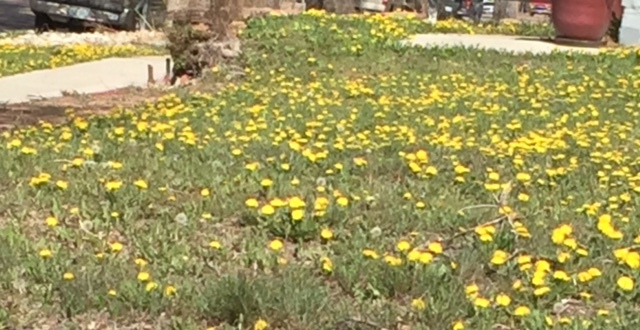 The idea for this poem came to me this morning when I passed yard after yard filled with beautiful, yes beautiful, golden dandelions and earlier in the week they had been filled with snow. The Colorado Rocky Mountain ecosystem and weather patterns in spring time are often just that chaotic and unpredictable. All of the trees have finally bloomed out here and the tulips have come up and yet, it snowed, and they all survived! I do believe we have come a long way in protecting Mother Earth, but we have a long way to go yet. We all leave too big of a damaging footprint behind when we die. I think our goal in life should be “pack in, pack out.” In other words, to leave the world as good, if not better, as the day we entered it. Nicely said. I like the image of renewal – snow one week, gold the next! !